Madame Waffle 1Utama welcomed us with a full house scene. The third outlet opened after Mid Valley and The Gardens Mall is still a kiosk, but wider space with comfy sofas and wooden furnishing to complete. 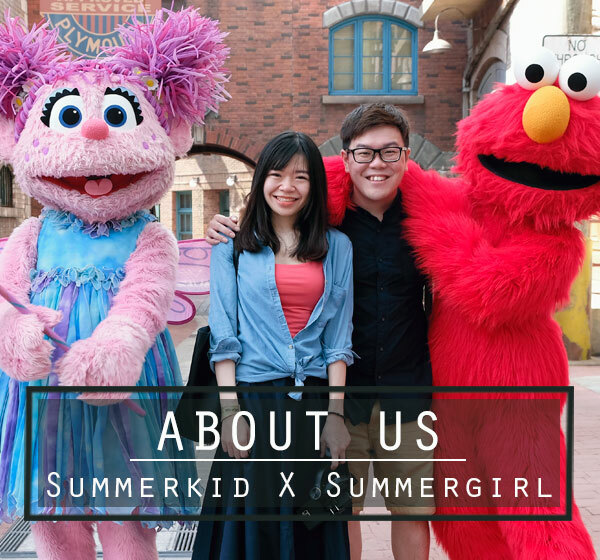 We are glad that Madame Waffle is now more organized compared to when we first visited them in Mid Valley. Service is attentive with lots of smiles, menu is still very focused by having Liege waffle as the signature order, together with decent coffee to round off. 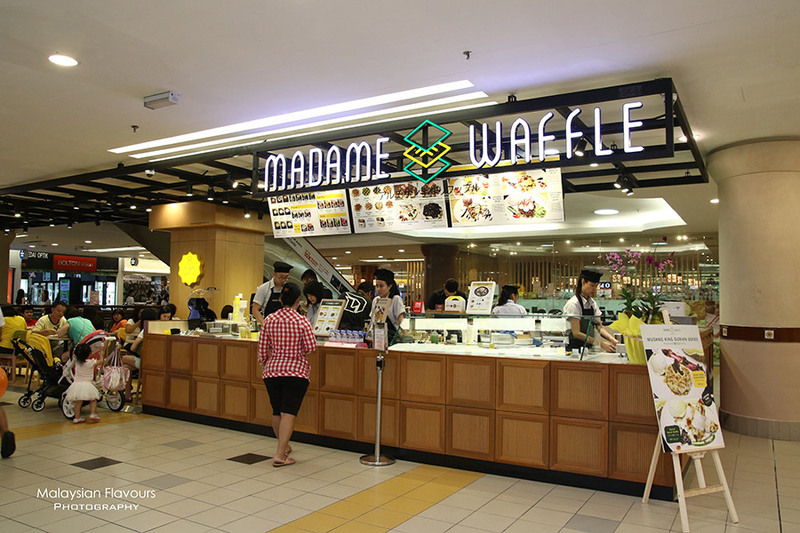 Madame Waffle One Utama is situated in between Sushi Zanmai and Dragon-I Restaurant, opposite to RUSCO. Even though the location has less foot traffic, this doesn’t stop patrons from flocking by to get a taste of this delicious dessert. For grab-and-go waffle, you can either go basic with their Classic waffle available in 8 flavours – Original (RM6.00), Matcha (RM6.80), Dark Chocolate (RM7), Almond (RM7), Honey (RM6.50), Cinnamon (RM6.50), Peanut Butter (RM7), Sesame (RM6.50); or reach for more fancy selections like Premium selections like Tiramisu Waffle (RM11), Sea Salt Dark Chocolate Chunk (RM10.50), Bluberry Cream Cheese (RM11), White Chocolate Lychee (RM11.50). Bring home 6 pieces original/assorted Classic waffles at RM33/RM38 if you wish to. 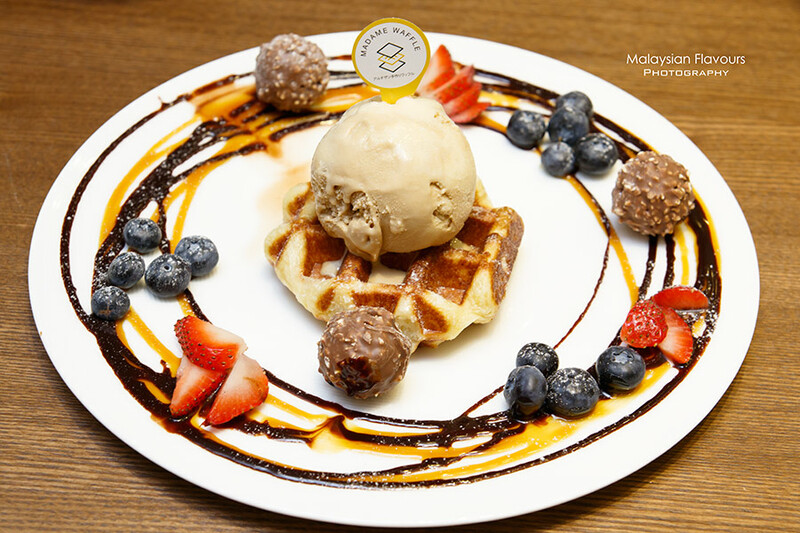 Dine-in Waffle is also available on Madame Waffle menu, putting together different ingredients such as ice cream, sweet sauce, fruits, spread and waffle to form a colourful combinations with whole lot textures. Madame Signature (RM17), Banana Nutella (RM18), Peanut Butter Crunch (RM16) and Shiratama Matcha Dango (RM19.90) all look good, taste great too. Staff at the cashier asked if we would like to “Make Your Own Waffle”. Of course we want! It is just a 3 steps mix and match, started with choosing your waffle base (Orignal Waffle/ Match Waffle/ +RM2 for change flavour), followed by picking your gelato (White Chocolate Lavender/ Earl Grey/ Chocolate/ Matcha/ Black Sesame/ Salted Caramel/Vanilla) and finally, pick any 3 topping listed on the menu (Fresh Blueberries/Mochi Dango/ Fresh Strawberries, /Ferrero Rocher/Oreo Cookie, Roasted Almond, Torched Marshmallows/Banana/Lavender Konnyaku/ Honey Corn Flakes/ Roasted Peanuts/ Azuki Red Beans/ +2 for additional topping). To celebrate the King of Fruit Season, Madame Waffle is now offering two dine-in waffles – The musang King Durian Series. 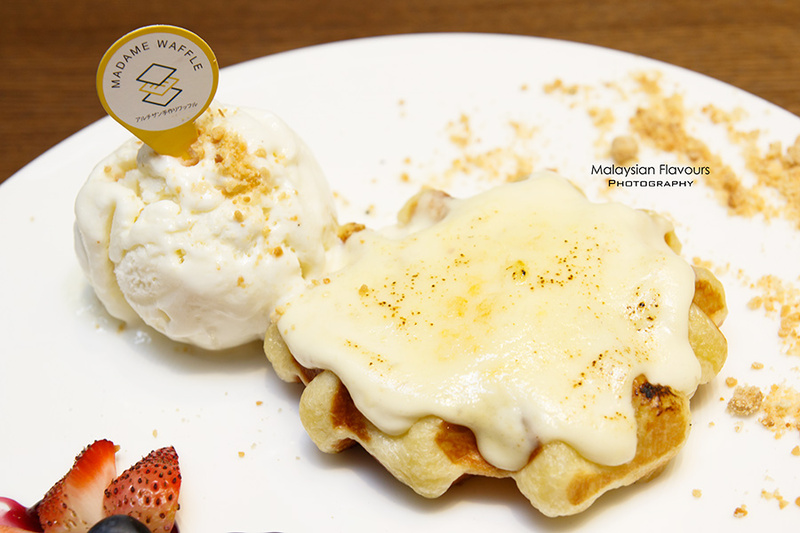 Durian Creme Brulee Waffle believed will be the crowd favourite, having original waffle topped with torched durian cream, sided with durian ice cream! A balanced of flavours, distinct durian aroma yet not overwhelming. 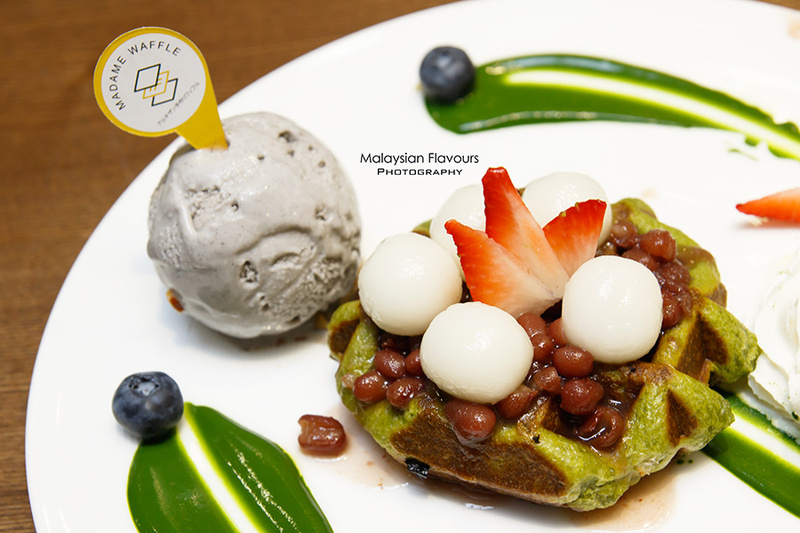 Another choice from the series, Durian Mochi Waffle is not shadowed too. Pale in sweetness, which is meant to be so as Madame Waffle Cafe would like to give an extra option for diners who prefer less-sweet dessert. 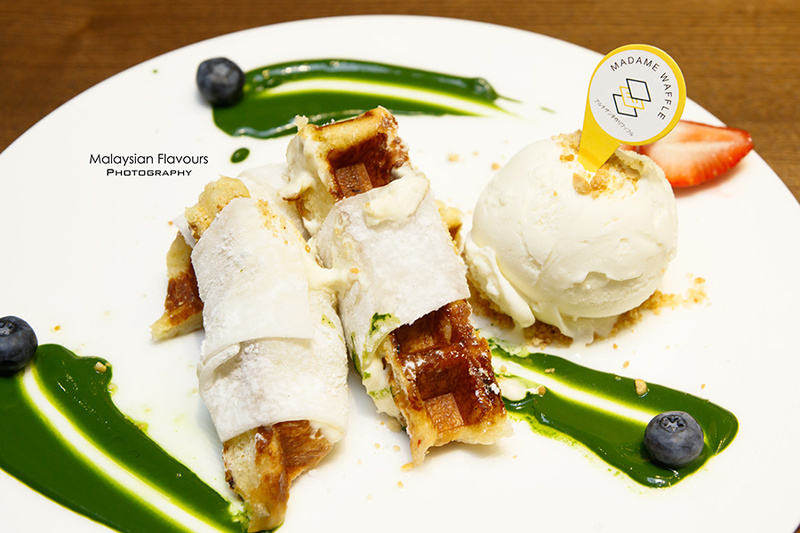 Sliced waffle wrapped with mochi sheet, adding more chewiness to the palate. Served with lovely durian Musang King Ice Cream and crushed peanuts.